At the center of new music in New York, Robert has performed with the American Modern Ensemble, Argento New Music Project, Fireworks Ensemble, Newspeak, and SONYC. Recent collaborations include Uri Caine, Georg Friedrich Haas, Aaron Jay Kernis, Steve Mackey, Joan Tower, Charles Wourinen, and Chen Yi. 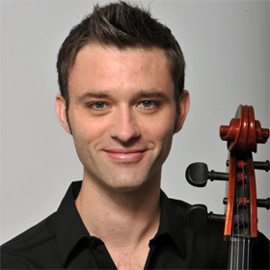 He has performed the New York premiere of John Harbisons Abu Ghraib for cello and piano, and was the soloist in Augusta Read Thomass Passion Prayers for cello and chamber ensemble at the New York Times Center. Roberts major teachers include Paul Tobias at The Mannes College of Music and Uri Vardi at University of Wisconsin-Madison, and he has worked with Timothy Eddy, Aldo Parisot, and Janos Starker at festivals and masterclasses. Robert has taught at Juilliard Pre-college, Mannes Prep, Syracuse University, and Music Conservatory of Westchester, and been artist-in-residence at Yale University and the Banff Centre for the Arts in Canada. His recent CD 20/21: Music for Cello and Piano from the 20th and 21st Centuries, features pianist Blair McMillen and the premiere of a work for cello and piano by composer Andrew Waggoner. Roberts recording of solo Bach on the American Express commercial Dont Take Chances. Take Charge. has garnered national attention.